This blog was created as a repository for all the knowledge I gain about diving in the Florida Keys. I am an aspiring scuba diver who intends to visit all the dive sites in the Florida Keys, but first would like to learn as much as possible about it first. Hopefully the information contained in my blog will be useful for anyone else wanting to get into diving in the Florida Keys. 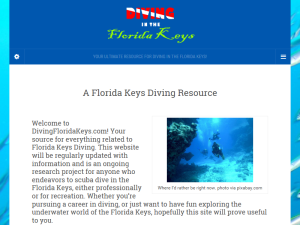 This what your Diving in the Florida Keys Blog Ad will look like to visitors! Of course you will want to use keywords and ad targeting to get the most out of your ad campaign! So purchase an ad space today before there all gone! If you are the owner of Diving in the Florida Keys, or someone who enjoys this blog why not upgrade it to a Featured Listing or Permanent Listing?